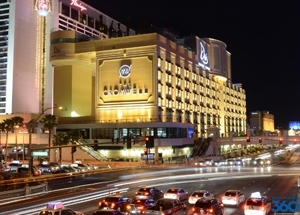 The Cromwell Las Vegas is a boutique hotel on the Las Vegas Strip. It opened in February 2014. The Cromwell hosts Drai's Beach Club on its rooftop. Drai's Beach Club is a major attraction for the Hotel. (Additionally, Drai's After Hours is located on the basement floor, and is open after Drai's Beach Club closes.) The Cromwell is at the same location as the former Bill's Gamblin' Hall & Saloon. This was also the same spot on the Strip that the old Barbary Coast was in operation. The Cromwell has 188 rooms and 19 suites. Its lobby bar features renowned bartender Salvatore Calabrese. The Casino has 40,000 square feet of gaming action, and all of the popular table games. There is a private gaming area called The Abbey. On the second floor of The Cromwell is The Giada Restaurant. Celebrity chef Giada De Laurentiis participated in designing most aspects of the restaurant. It serves Italian food with California flair. Bellagio's fountains are within view from inside the Giada Restaurant. The restaurant has private space for larger parties. There is an outdoor area with Strip views, as well as a lounge. Need a quick meal? 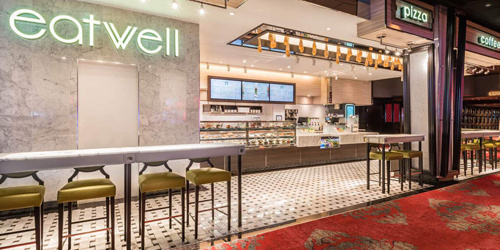 Grab a tasty bite at eatwell inside The Cromwell. This 24-hour casual walk-up counter is where to go if youÂ’re looking for a gourmet snack or light meal at any time of day. ItÂ’s conveniently located near DraiÂ’s After Hours club so itÂ’s the perfect spot for a late-night nosh on tacos, pizza and more. Partying at Drai's with friends until the sun comes up? Grab a pastry or breakfast sandwich. Plus eatwell proudly serves Starbucks coffee to get you caffeinated in the morning. The restaurant seats 28 and serves a variety of drinks and food including salads, sandwiches and featured items. Be sure to try eatwell's signature chili cheese Barbary dogs. At three (plus a drink) for $5 they satisfy late-night hunger cravings without breaking your budget.